This DIY All-Natural Face Oil for Acne-Prone and Oily Skin combines the best carrier oils and essential oils to keep skin clear by fighting blemishes and reducing oil production. Yes, applying oil to your skin can actually reduce the skin’s own oil production! Learn why it works + grab the recipe! Some things are just real head-scratchers. Like how putting oil on your face can actually make your skin less oily and less break-out prone. It took me years of frustration and poisoning my body with chemical-laden skin care products before I finally experienced this last one firsthand. I always thought that oil in skin care products was to be avoided at all costs. So putting straight oil on my face? Oh heck no. But then I got desperate. And I did it. And it worked. And now I’m hooked! So how exactly does oil help to keep skin clear? The skin produces oil (a.k.a. sebum) as a natural moisturizer. Sebum is totally natural and even necessary, but excessive sebum production can increase the risk of blemishes. Applying oil to the skin can help reduce the skin’s own production of oil. Important note: excess oil production is often a symptom of hormonal imbalance. 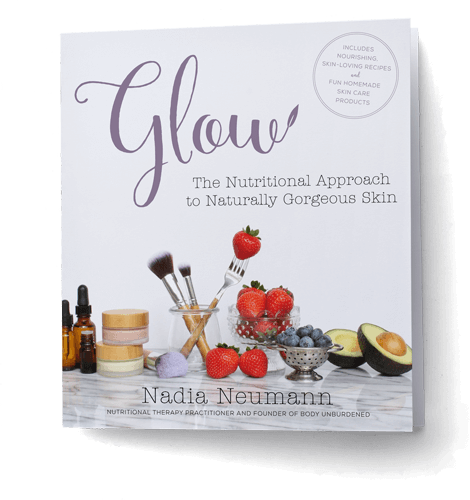 You can learn more about this and how to balance hormones naturally in my book Glow: The Nutritional Approach to Naturally Gorgeous Skin. When the skin’s own oil or sebum oxidizes, it becomes extremely comedogenic or pore-clogging. More and more, this is becoming recognized as a primary cause of acne and breakouts. Most face oils are rich in the antioxidant vitamins A, C, and E, which prevent sebum oxidation. When it comes down to it, a zit is really nothing more than a sticky mess of oil and dead skin cells. And since like-dissolves-like (in other words, oil and water don’t mix but water and water do mix as do oil and oil), applying oil to the skin can actually help to break up this sticky mess and clear it from the pore. By helping to reduce inflammation and moisturize the skin, face oils help blemished skin heal more quickly and help reduce the risk of scarring. Applying oil to my face was a total game-changer for me! My breakouts are virtually non-existent. Yes yes, I’m now one of those lucky ladies who gets to freak out when she gets one little zit before her period and it feels AWESOME. Want to know the feeling? This simple face oil for acne and blemish-prone skin can help you get there! You’ll also need a 2 oz. glass bottle with glass dropper. Jojoba oil: a light oil that is easily absorbed. It mimics the skin’s sebum, tricking it to produce less oil. Tamanu oil: has strong anti-inflammatory, antimicrobial, antibiotic, and antioxidant properties, making it ideal for acne sufferers. It also helps regenerate skin cells, helping to heal broken skin and reduce the appearance of acne scars. Lavender essential oil: has powerful antibacterial properties and also helps calm inflamed skin. Frankincense essential oil: has antibacterial and anti-inflammatory benefits to the skin, making it ideal for acne-prone skin. It is also a natural toner, decreasing the appearance of pores and evening skin-tone. Add all of the ingredients to the dropper bottle. Put the cap on and give it a little shake! Apply 4-6 drops to clean, dry skin. Interested in other carrier oil and essential oil options? Ohh good question. About 4-5 drops. I’ll be sure to edit the post with this – thanks for asking! I use a blend of tea tree and neem oil and it works really well although it smells awful. I’d like to try Tamanu sometime. Right now I’m using Pumpkin Seed Oil and it works pretty well. I like Jojoba on my body and my hair but for some reason, it doesn’t agree with the skin on my face. I have crazy sensitive skin, it will blemish if you look at it funny. Oh no! What you wrote actually made me LOL but I’m sorry to hear that 🙁 So glad pumpkin seed is working out for you, though. I have yet to try it! Hi! Thanks for the great information! I’ve just recently tried using coconut oil to wash but am feeling like I want to try something different. Does this work well to remove face and eye makeup too? I’ve been using apricot kernel oil with lavender essential oil. (20 drops apricot with 1 drop lavender). So far I’ve been loving it. My face is not dry and itchy any more, and dewy looking. But I am still having tons of black heads on my nose and white heads all over. Can you give me some ideas for getting rid of them? What kind of oils to use? I also do a scrub every once in a while. Like every two or three weeks. Thanks so much for sharing!!! Where do you typically buy your oils? Thanks for posting links to the products you use. I’m going to start using essential oils. Your posts have really helped me get started! Hello Nadia! First off, LOVE YOUR STUFF, I just found your site recently on Pinterest, and I can’t stop reading all your posts 🙂 My question regarding this mixture: would rosehip oil benefit this mixture at all? I was reading about it’s properties, and I would like to incorporate it in somewhere. Much thanks for all your awesome-ness!! Thanks so much for the kind words, Candice! So happy to have you as a new reader. YES! I love Rosehip, but it can be irritating for some acne-sufferers which is why I put tamanu oil in this post. I have the exact same mix with rosehip (and a different combo of EOs) that I use less often. Both rosehip and tamanu are dry oils, so they are best cut with a thicker oil like jojoba. Hope this answers your question! Just tried this recipe for the first time and I am really excited to see the outcome. I was wondering what you use in addition to this for your daily routine. Do you have a makeup remover or face wash that you use? I am a new reader and I must say I am stoked!!! all your recipes are amazing! I am so excited! anyways, I understand that you use this for a moisterizer. What do you use to wash your face/take off your make up with first? and do you wash every morning and night? thank you! Hi, Taylor! So happy to have you as a new reader 🙂 I use this DIY foaming facewash in the evenings: https://bodyunburdened.com/diy-all-natural-toning-clarifying-foaming-facewash/ It’s really simple and does the trick for me. While it is slightly drying, the oil keeps my skin from drying out. But by far my favorite skin trick is exfoliating with baking soda! I do it about every 3 days – it’s a game-changer. so. i have combo skin that is sensitive and prone to breakouts (hey stress/caffeine haha) and i just made your clarifying face wash with the castile soap. it’s only been a couple days but so far it’s working great! no irritation and i’ve been skipping my am moisturizer in lieu of just a nice rose water toner. in the evening, i was using straight rosehip or argan oil but now i also have jojoba in the mix since i bought it to make your wash. do you think i should just swap the rosehip oil in place of the tamanu since i don’t have that on hand? i typically use the rosehip oil straight every other night since i heard it can be irritating but i don’t think i’ve noticed any strong reactions from it. any advice? thanks! Yes, you can use rosehip instead of tamanu for sure! great!! Thank you so much!!! one more question. I am debating making the diy facial oil or buying the wild rose facial oil from mountain rose herbs. Which do you prefer? Oh that’s up to you! MRGH is fantastic, and if you’re not a DIYer, I’d go with that! It depends on whether or not you want to spend the money on each individual piece that goes into the DIY, or just buy the one from MRH. Ok!! Thank you so much!! You are so inspiring! Thank you for helping us!!! Hello! This site is absolutely fantastic. I’ve recently made the switch to all-natural care and it has been such an enlightening and freeing experience! Anyways, I really want to try this face oil! I wash my face at night with a mix of castor, jojoba, and lavender oil, and have been treating with tea tree oil overnight. I splash my face with water in the morning, since I don’t like the feeling of excess oil on my face during the day. Do you think it’d be overkill to leave this face oil on overnight, or is it light enough to use during the day? P.S. Sorry to bombard you with my skin care routine; I’m just not sure where this would fit in! This face oil is very light and so it’s what wear during the day (except I just made an SPF lotion that I’ll be wearing during the summer!). Tamanu and rosehip oil (which you could use instead of tamanu if you’d want) are both dry oils. So they cut the jojoba significantly (which really isn’t too thick of an oil to begin with). If you want it to be even more dry, just add more tamanu or rosehip! But if it’s too dry, it can irritate your skin. Does that answer your question, I hope? Absolutely! That helps a lot, thank you. 🙂 I’ll definitely try it during the day. I created and have been using the DIY all-natural oil treatment for acne prone skin, reading about how it was the miraculous answer people had been missing. I was hoping and praying because I have spent so much time and money on so many different treatments, meds, products…how long should I give this to work? My pores might be slightly less nasty, but my break outs are worse than before, and now with cystic acne from the oil. Not an allergy, but more pimples that won’t go away and they itch and hurt. I had a friend tell me she got worse before better, but it’s been about 3 weeks. I just want decent skin so much- not to have to use layers of concede are, worry about my makeup uncovering my skin and scars, to be able to swim with my kids and not think about my skin, etc…help! Thanks! hey april, i was using this foaming wash for 2 months and had to stop. my skin was pretty clear before and by the end i was getting tiny, irritated bumps on the upper parts of my cheeks/temple area. i think it’s because there was residue from the oil/castile soap left on my skin that i wasn’t getting off. i never used a cloth to rinse, just water. i just use caudalie foaming wash now and it’s working much better. just a simple wash without a lot of fragrance and isn’t too drying for my combo skin. things are back to normal now, good luck to you! Hi! I’m new to EO! Can I substitute the doTerra Lavender Eo for Young Living? Thanks!! Hi Nadia! Great page I’m very inspired here! Just wondering how could I incorporate geranium oil in my daily routine? Very much like the sound of it, never tried it though. Is it a good idea to put some in this recipe or the face wash? Or is there a reason why you don’t use it? I lover geranium! I just don’t specifically have it in any recipes posted on the blog… You can use it with or instead of other EOs in any recipe! Just remember the dilution ratio, which is very important (EOs are powerful and you don’t want to use too much!). Hi, Leah! Yep, if you have DT oils, of course! Yep! You can really use any oil or even EO you’d like – this is just my favorite blend! Just remember the maximum 5% EO dilution. Is this blend safe to use in the daytime? I know some oils like rosehip increase photosensitivity and don’t want to worsen my acne scars. Please let me know!! I have created a mix that addresses my 50-yrs. old sensitive, oily, acne-prone skin: In a 2-oz. brown bottle (with dropper) I fill the bottle with: 30% castor oil 30% jojoba oil, 30% argan oil…and then 10 drops each of tamanu oil, turmeric oil, thyme oil…and 3 drops of rosemary oil and carrot seed oil. Far clearer, far less sensitive, no breakouts! Always buy 100% organic oils. Hi Nadia. Is there a Frankincense oil alternative? I don’t have that one on hand and am hoping there’s something I can substitute. Definitely! Just use your favorite oil for your skin. This is just the recipe that works for *me* and that I use everyday – but it is totally customizable! Hi! I’ve stumbled upon your blog when researching for use of oils as moisturiser since I’ve been struggling to find one that works for my dehydrated (I believe dry and dehydrated skin are different) yet oily/combination, acne-and-scar-prone face! (Although I have to say I’m so used to pimples that I’ve reached a point of not being bothered by that…!) I know extra virgin olive oil is an amazing natural oil with multiple use and learned that it can be used as face moisturiser. But then I’ve read all about these essential oils and carrier oils that I get so confused of what I should use on my face! And also since I’m just a newbie in this, I don’t really want to spend lots of money buying many different oils and end up not using them! So I just wonder if you can give any advice on how I should start using oils as moisturiser? Hello! I have come across your blog and am going to be trying this moisturizer out this week. I was wondering if purification could be added to the mix as well? If so, how much should I add? I’m just trying to figure this whole thing out 🙂 I suffer from acne combination skin and am willing to try anything to help fix it. Do I lessen the amount of all the frankincense and lavender since I’m adding amother essential oil? Can I just do equal amounts of all three? Hi, Jess! I’ll cross my fingers for you! You can use any essential oils or carrier oils you want, this is just the blend I use. But EOs should always be diluted to a maximum of 5% (since 1 ml is 20 drops, for every 1 ml of carrier oil you would add 1 drop of EO). Best of luck! Thank you! I am terrible at math lol. I love how the blend felt on my skin tonight. It was my first night trying it and I really hope this works. I know you added 9 of frankincense and lavender to a 2 ounce bottle. I added 10 drops of each (hopefully that isn’t too much) but I do know that those three oils do not need to be diluted to use. I have been reading a lot of your posts and appreciate all the information. I was looking over the young living site, to get an idea on the prices per bottle, and I could not find jojoba oil or tamandua oil on the YL site. Do they carry these oils? If so exactly where do I go on the site to see their information on the oil? I just buy mine on Amazon – the links are above in this post! Hi Nadia!! I just discovered your site, and I’m really excited to use your recipe for my moisturizer!! I just started on the path to using actual natural oils/honey on my face versus products that are made of natural ingredients. I was just wondering what you think of using camellia oil as a face wash? I’ve only recently started using it somewhat regularly, but I was also wondering if there were better options? I saw your recipe for face wash, but I’m scared of tea tree oil because I ised a tea tree oil product before, and my skin didn’t like it.. I have really oily skin, and recently, it’s been acting up even more (maybe because of the cold weather? ), and I really want to get my skin on lockdown. I have tried so many different product lines (currently seeing how Tatcha fairs on my skin over an extended period of time), but it seems like my skin is rejecting the moisturizer or just doesn’t like it. It doesn’t feel like it soaks into my skin. Pleas help!! I would love to know your thoughts on all of this!! Well if you want something that sinks into your skin, def try jojoba. Maybe plain at first to see how your skin likes it, and then you can try a blend if you want. I’ve never tried camellia oil before and am assuming you’d do oil cleansing method, right? That’s 100% your call. I don’t like OCM because I don’t feel like my skin is ever clean with it, but that’s my own thing. As for my face wash recipe – it’s totally customizable. Don’t like tea tree? No problem, just leave it out. If you do this, I’d suggest making a smaller batch though since the tea tree does also work to inhibit bacteria growth in the wash itself, which is very important when it comes to natural DIY products (and make sure your jar is sterile). On a side note, some people wash with just honey which you may like. Or maybe some honey and a little castile mixed? That sounds like a nice balance of cleansing and soothing. Hi! I’m loving the comments and recipes and suggestions. Can someone tell me exactly how many drops of tea tree oil to mix with tamanu oil for face scars or should I use the lavender essential oil? Hey Nadia, can I use tamanu with rosehip oil? Then put the essetial oils in this mix?? Sure but those are both dry oils. Yes, this is just the mix I like to use – you can make your own with your preferred oils! About how many drops of essential oils should you add to the tamanu oil? Hi, Tahirah. I put all of the measurements above in the post. Thank you! Also I’m trying to see if you mentioned it, but for scars, (dark marks from acne) which is better tea tree oil or lavender? I have just discovered your site and I am very excited. I started using just the Jojobo oil and I noticed a significant difference in the amount of blackheads on my face. Now I am trying your recipe about and I added a bit of tea tree oil to it. I’ve only been using it a few days, but now I am having several breakouts. I am not sure which oil is the culprit or if this is a “purging” that can happen. Could any of these oils be worsening my acne? Do you use the recipe above at night as well as morning? Please help. Hi Nadia, do you use this around your eyes as well? Have you ever used wheat germ oil in any of your regimens? No I’ve never tried that oil! I just dab a little shea butter around my eyes – I’m wary of getting EOs in them. Hi Nadia! I have been doing the oil cleansing technique now for about 2 months, and I have been using grape seed oil morning and night. Would it be too much for me to cleanse with the grape seed oil , and than apply this DIY moisturizer? Is it light, and non-greasy enough for a daytime kind of moisturizer, say for underneath makeup? Also, instead of jojoba oil what is the next best oil to use? Can I use almond oil or even grapeseed oil? Can you use coconut oil as the carrier oil instead of jojoba? Coconut oil is comedogenic so I don’t recommend it. Also because of the high melting point it is most often a solid. But if it works with your skin then by all means, do it! Awesome!! So glad it’s working for you!! Hi Nadia! This is all so helpful. Do you have blend you would recommend for acne prone dry skin? Thanks so much! JOJOBA! Always 🙂 Try it and if you like it and want to experiment more, then you can add some other oils or EOs. But I’d start simple with jojoba. I’ve been putting a concentrated oil on my face at night, and after many years of bad acne my skin has cleared. I noticed a huge difference after the first night actually. It’s antibacterial, anti inflammatory, and helps skin conditions all over the body. I made a batch for my friend with scoriocis and it worked great! I can’t wait to try some of the oils you recommended though. I think I have the oiliest skin on the planet. Recently someone I met, who had a beautiful complextion, told me to use evening oil of primrose. What!!!! Oil on oil. But, it’s fantastic. Absorbs into the skin and is a great primer for makeup. I need to look into that one! Love this combo for the day! Going to try it tomorrow am . . . what combo do you use at night? so i tried it and had small red bumps all over my face the next day, maybe a reaction to the lavender or frankincense? how would you tweak this to deal with a possible allergic reaction? Hi Nadia. I want to order a couple of oils for your blend from mountain rose herbs. But for some reason, i cant fill the “postal code” field. it says,to match the requested format. do the do international delivery to the UK? thank you, Nadia. Oh no, I’m sorry to hear that! You can do a small test the individual oils (diluted in some carrier oil) on your inner forearm to see which one is causing the reaction and go from there. Hey nadia! Thanks for the above I would like to give it a try. I used OCM and it didn’t work well for my acne…I broke out a lot more…I’m about to give purchase the above oils and give it a try. Just one question once I put on the oils do you wash it off…do you place hot towel over your face….or do you just keep it on all night? I have question….If you are using oils in the morning what else are you putting on your face? Sunscreen? Make-up? Where can I buy the essential oils other than Amazon? I use it after I wash my face, just like any old moisturizer! I’m new to oils…when you put the drops on your face, do you wash it with a face brush and water after or just blend the oils into your face and leave them without rinsing? Thanks!! Yep, just blend and leave on like a moisturizer! I’m so excited to try this! Can I use this blend at night instead and just use my normal moisturizer during the day? Yes, exactly! I use it as a moisturizer. Hi, thank you so much for this information. I have been using your recipe the last few days and my skin and acne is so much better. Quick question though, is this mixture ok to use as an eye moisturizer too? If not, do you have anything that you recommend. Thanks in advance! YAYYYY!! That makes me so happy to hear! As long as you don’t get it in your eyes, yep! Hi Nadia, I have been using your mix with a little twist: 3/4 jojoba, 1/4 of half tamanu half rosehip , 6 drops of frankincense, 6 drops of lavander, 6 drops of geranium. Plus all the routine: your wash 2 times a day, your exfoliating baking sofa mix once a week, your honey mask once a week, and the oil mix twice a day. Plus a little tea tree with aloe for break outs. The first two weeks was amazing and a huge change for my skin! Everything was going more than good! Pores were small, had a glow, super clean, the skin was tone, very little blemishes (that’s were I put tea tree) And this 3rd week I broke out all over my face and have a light redness all over , also some dry patches. Do you have an idea of what went wrong? Not even the honey mask or the aloe Vera with tea tree or by itself is fixing it. I did notice that the wash was leaving my face a little dry but was using more amount of the oil mix..
My skin in a combination, Prone to blemish, and all my life had tried products for acne and everything made my sking dry and I ended up with more blemishes.. If you have a chance please send me your thoughts. Might be a dumb question, but am new to oils, do you wash this off or keep it on like a moisturizer? Oh no, that’s not fun! Do you think it may be hormonal or linked to your diet? I only ask since you said it was after 3 weeks. Perhaps the castile soap in the wash is too drying for your skin. Maybe find an alternate (or you could try the oil cleansing method or just washing with honey like my girl Lauren over at Empowered Sustenance) and see if that helps…? We all have different skin so what works for some will not work for others. It can be a game of trial and error when finding the best skincare products for you but you’ll get there!! I think it was the baking soda exfoliant! It’s all better now. Not red, but still with tiny little bumps. I am doing the wash, toner (alcohol free which hazel) and the oil mix. For now don’t want to do baking soda but will keep my honey mask once a week. As for the OCM, I find it to “risky” and there is a lot to read about that method.. I really think I did break my face skin barrier with the lemon and baking soda. I do want to give more time to the wash, I love it, but already thought of washing with honey if it doesn’t work.. Thank you so much! I panic! I understand now that it takes some trial and error! And thank YOU! Not only for answering and all the info, but for opening a door to a healthier, planet friendly, etc, life for me and my family! We just started, but we are not going back! Thank you so much Nadia for the help……………appreciate it. Hi Nadia. I have been using your blend and it has been working for me so far! I was wondering if you hand any tips to help protect my skin from the chlorine. I have cystic acne and have been suffering from it for about 8 years. I am a lifeguard at my local public pool so I’m in the chlorine a lot and I find that whenever I come out of the water I I break out more. Any tips for protecting my skin from the chlorine? Hello Nadia! I used olive oil to massage my face and I only did it foe about two nights and my face broke it so BAD! I t was the worst break out in my life since it was over my whole face. I want ted to know if you have had any experience with olive oil and how it go for you since you have oily skin too. I guess I am just not using the right oils for my oily skin, but I really want to use oils because they have such great benefits for the skin. It’s been a month now and my breakouts are clearing up BUT now I am afraid to try oils. I have used jojoba in the past I used the dessert essence one, and it’s just not too great All the oils I’ve tried so far did not work out for me. I have used jojoba, olive, coconut, rose hip, hemp seed, and finally grape seed. but i am so glad I have found your site so I can learn more about natural care. Oh no, that stinks! No, I have not ever tried olive oil. personal question, do you find that argan clogs your pores? i use a very similar formula to this (including argan), and while I have fewer pimply breakouts I feel like I have more blackheads. I’m also not sure how I feel about tamanu. I personally do not do OCM but instead use them as moisturizers. I can’t wait to try this, but I was wondering if I can use this twice a day or would it make my face more inflamed? Can you us geranium instead of frankincense oil? how long does this bottle last for? do you need to add vitamin e to it? Can you change the frankincense to lemongrass? Or geranium? Yep, it’s totally customizable based on your skin needs – this is just the blend that I really like that works best for *my* skin. It depends on how much you use – if you use just a few drops as I mention in the post, it will last you for quite some time. No need to add vitamin E oil as a preservative but you could if you want. My daughter has acne prone skin but also her skin is extremely dry. She looks like she has a rash on her face at times. Is there anything that you could recommend. I had just asked about my daughter.Also what carrier oil and essential oil would you recommend. She has acne prone skin but also very dry skin, that it looks like she has a rash at times. Her skin is sensitive. Thank you in advance. Hi! I am actually very sensitive to jojoba oil and break out in a rash every time I apply it to my skin. Do you have any suggestions to oils that are similar to jojoba? Thanks! I would love to do diy’s, but really with 2 young babies…I just can’t find much free time. Do you have suggestions on all natural store bought items for a full face routine? Make-up remover, wash, toner, moisturizer, mask. Anything really would be great! Totally understand!! To be honest though, you could pick just 1 face oil and use it (I often use just jojoba oil) as a moisturizer. But I talk about some of my favorite natural beauty and skincare brands here: https://bodyunburdened.com/resources/ 100% Pure sells a nice face oil blend, actually. And I talk about some of my favorite products from these companies here https://bodyunburdened.com/all-natural-skincare-beauty-routine/ if you’re interested! I use coconut oil on my face every night and morning. I love it is never found a moisturizer that made my skin feel so good but id like to get some oils to add to it. …. what would be a good blend? Im 33 and aging lol i have acne prone skin like 3 weeks out of the month and its kind of oily but not bad. I was thinking lavender and tea tree…. is there anything else i could put with it? i love this idea! But what do you use for a face wash? My face is very acne prone and extremely oily. Any advice would be amazing!! Hello nadia, my boyfriend is 25 years old and has a bad eczema condition on his face and forearm. I’ve researching about EO and Oregano oil popped up. But I’m really scared to try since I’m afraid that it would worsen his condition. Is there any idea how to start? And what is the best carrier oil I can use? I just found this site and I’m looking forward to trying these oils. The only oil I’ve tried is coconut, which works well for my legs and feet but not my chest and face. I have bags under my eyes as a result of pulling on them from contacts. (I didn’t know) Do you think if I add oil under my eyes it will make the bags worse? I would also like to know if you exfoliate, how often and what you use? My skin is somewhat dry and I’m starting to get adult acne and it’s also becoming a little sensitive. I feel like I should be exfoliating but I know your supposed to be gentle too, so I’m confused about the best way. Dudes, the key thing is to use an oil high in linoleic acid and low-ish in oleic acid. That’s why almond oil, shea butter, and apricot kernel oil can cause break-outs. Rosehip Seed Oil is the new breed. I found your blog and started using this oil mix hoping it would help clear my acne. It’s been a few weeks now and it doesn’t feel any better, it actually feels like its worse. How long till I start noticing results? Also, do you have any other recipes for acne prone skin? I use a half-and-half blend of Jojoba and Sweet Almond oil on my body. I mix it with filtered water and put it in a glass spray bottle. It’s super convenient and a quick way to moisturize your whole body! As for my face, I’ve just been using African Black Soap to cleanse and rosehip oil to moisturize. So far, so good. Oh no! It may just be that these oils are not right for you — everyone’s skin is different. It’s really up to you! I used to wear it both morning and night and would use powder makeup over it during the day (now I just use it at night and use a CC cream during the day). Hi I decided to try making this today but I was wondering if there was a differebt oil I could use besides tamanu oil? Thank you! I wash my face once in the morning and once at night and use moisturizer afterwards… is this routine still okay while using your oil combo moisturizer? And what kind of daily facial cleanser do you recommend? I’m 18 with dry and mildly acne-prone skin. I recently discovered that I have a mild case of eczema on my chin, and after going to the dermatologist and paying for the creams they suggested and having negative side effects to two antibiotics they prescribed, I gave up on them. I am looking for a good routine and natural products to use. I pinned your all-natural face oil for acne prone and oily skin, so I must ask will this be a safe and beneficial things to use on my face with eczema? Hi Nadia, I was wondering if you could use grapeseed oil as the carrier oil instead of jojoba for this face oil? You can really use whatever you want! THIS is just the combo that I like best for MY skin. It may be… but I’d look into some nutritional support. Omega-3s from a quality fish oil or flax seed oil work wonders for skin and skin issues, as do healthy fats generally. Also, the gut microbiome plays a big role in skin conditions, so you may want to look into a high-quality probiotic (you want at least 10 billion bacteria count and a variety of different strains). Many people have had great success kicking their eczema to the curb with proper nutrition. Best of luck!! Hi Nadia, Great article which pushed me to actually buy the essential oils listed by you. However, i am a lil confused while reading your instructions. You have mentioned 2 oz bottle (which also I procured) and then suggested 9 drops each (total 18 drops of EO) of Lavender and Frankincense EOs. Now 2oz = 60ml = 1200 drops. So, 18 ml is only 1.5% dilution and not 3% as mentioned by you. Please suggest should I go with one Oz bottle with same quantities as mentioned by you or can I simply double the quantity (18 ml of each EO) with the 2 Oz bottle. Thanks for reading and taking out time to reply. Hi Nadia!! First of all, I am completely new to essential oils, and your site had made me want to try them right away!! I have read most of your recipes, but there is so many things to read and it is getting confusing. Could you maybe make a post stating what your morning and night routines are and attaching a link to the recipes you have posted because that would be the best page ever!!! Are you using this oil as your morning moisturizer after washing your face? I usually wash then use an alcohol free toner then moisturizer so wasn’t sure where this oil fit in your morning cleaning routine? Thank you for your posts! its simply and very inspiring. Question… can i replace tanamu wth VCO? or any suggeations about using VCO? Thanks much in advance Nadia! Wish you the best! VCO… virgin coconut oil?? If that’s the oil you like for your skin, definitely! Coconut oil clogs my pores but if you know it works well for you, by all means use it. My daughter has ceratossis palariss, a skin condition thats very painful, and sensitive. Her face turns red, and never goes past her face line. I have tried a lot of things for her and to no avail. I’ve been using essential oils for a awhile but never thought to put on face because there are oils. What do you suggest? Hey! Got to your website through pinterest and Im loving the content! Thanks for sharing all these tips! I wanna give a try to the recipe, but I’m not from USA and I couldnt find rosehip or tamanu oil… Is there any other I could use to get the same result in this mix? If you have any suggestion I would love to give it a try! I can’t express how happy I am I found this website! It all sounds like exactly what I need to clear up my skin. Do you have any DIY shampoo’s or conditioner’s that you use or could recommend? I’m new to using essential oils but the little I’ve tried I’ve been very impressed with. I have had terrible acne every day of my life for the past 20 years. I was curious you didn’t suggest tea tree for the oil for acne prone skin recipe as I’ve always been told that is one of the best oils for acne. If I were to add some tea tree, would I decrease some of the lavender and frankincense to make sure it’s still diluted or would that make the other oils not effective? Or is tee tree not necessary if using the lavender and frankincense? Thank you for these great posts! Yes, you would adjust the amounts of the other EOs (you don’t really need them at all, those are just the ones I use). Love your post…. Glad I found this site cos I just started using EO and your post have been very helpful. Thank you. Just got back from the store and am so excited to give this a try! One quick think I noticed, I accidentally grabbed a Frankincense oil that is “in jojoba oil” meaning it’s not exactly a 100% solution. Do you think this will have any big effect, aside from possibly being less “potent”? Thanks! YAY! Well it will definitely be less potent but I can’t be sure to what degree. I’d add 1.5-2X the amount. Hey, thank you for your articles and reviews! Can i please ask you to give advice on how to mix jojoba, hempseed and tamanu oil for daily face use? Hey Nadia, Can u plz share how do u use all these essential oils u have mentioned in ur two of the articles ( top ten essential oils for skincare and five essential for clear and flawless skin). It will be a great help as am new to use essential oils and planning to get them into my skin care routine. Bought all the oils for the essential oils for acne prone skin. I got as far as putting the oils together and onto my face. My question now is, what do you do after that? Do i steam thses oils and wipe wiyh a wet towel? 3times? Or do t live the oils on? I want to know i am doing it right. Thank you ahead of timem. Can I also add a few drops of tea tree oil into this mixture? How would you incorporate tea tree oil? Can you explain to me how do you measure? Hello! I’ve been reading all your articles for the last hour, I love them! I have decently oily skin, with blackheads all on my t-zone, and little acne bumps on my forehead that never break out to full blown acne (I’m assuming this is also from my oily skin). From what I read, I was thinking about mixing jojoba oil with EO Geranium oil. Is this a good idea, or would you recommend something else? Also, what measurements would you recommend for each? That sounds like a good combo. You may also like lavender which is great for all skin types and antibacterial (for the blackheads). Also, you may be interested in my DIY all-natural blackhead busting blackout mask! Loved the recipe. These natural things are way better than chemical induced things which ruin the skin and are heavy on our pockets too. Just one thing, both jojoba and lavender oil are mildly comedogenic. So if you’ve got highly sensitive skin (read : like mine duh!) that breaks out easily, use argan oil and geranium oil instead. Neem oil is good too. But tea tree and lemon oil can irk the skin and cause redness and rashes. Plus if you want added benefits like spot and blemish reduction you can try mixing some turmeric and strands of ‘kesar’ I.e. saffron. It’ll work wonders trust me. Hi Nadia, I just made a batch of this. It’s smelling more spciy than I expected. I did a quick search and realized that a lot of people say that Tamanu oil sometimes spells like curry – which is what I’m getting. Is that normal? Can I add more Lavender? You just want to be sure you don’t go over a 5% dilution for EOs, which is 29 drops of EO per oz of carrier oil. Not sure if you are still active on this site, but I figured I’d try hope for a reply to three questions I have… Would tea tree oil work instead of frankincense? Does this oil blend make your skin sensitive to the sun? And finally, do u have any recommendations for sunscreen??? I thank u in advance and really look forward to your reply! Hi, Dorothea. Hmmm. That’s interesting. Maybe try patting your skin dry before applying? Applying it to wet skin could be diluting the oil and preventing it from penetrating the skin. If that doesn’t work, have you ever tried shea butter? It’s super moisturizing and filled with skin-loving vitamins — I apply it over my jojoba to dry patches in the winter. Yep, this oil blend is totally customizable… this is just MY favorite blend. And no, these particular oils do not make you sensitive to the sun. In fact jojoba oil has a natural SPF of 4-6 (which obviously isn’t HUGE but it’s a good everyday coverage). And if you’d rather not DIY, my favorite ready-made sunscreen is Badger sunscreen, which has a “1” Skin Deep rating. Hey, Angela. YAY!!! That makes me so happy to hear 🙂 As long as you don’t get moisture in the blend, it should last until it runs out! Do you wear makeup regularly? If so, do you wear this under your makeup? Can the DIY face oil be used as a day moisturiser instead of a night one or will it be too shiny? I’m just worried about it clogging my pores. Well it’s oil so it’s def shiny 🙂 but I think it depends on your level of comfort with shininess. What do you use at night? Do you use in place of moisturizer? Do you apply after toning? I am currently using Aveda facial products, which I love, but I really want to incorporate these oils, as well. Clearly I LOVE OILS 🙂 so think it’s a great idea for you to add them into your own routine! Really enjoy your blog…and love all the recipes especially for acne prone skin…but there are so many i want to try and wanted to know if there was a specific regimen that works for you…like when and which recipe for cleansing and when and how often to use say a bentonite clay mask or a charcoal mask…etc. Also my skin gets irritated from lavender oil- I was wondering if i can substitute the lavender with manuka oil and get the same effect in your acne prone oil recipe? Your website is so awesome with simple and natural DIY stuff.I know you mentioned to use this in the morning,but I use my light day lotion with SPF which is working for me. Can I just keep this for like 30 mins and wash it off or you suggest to keep all day? I’m sorry if it’s a repetitive question. Do you wash it off? Or just leave it on? I use it as my moisturizer. I love your blog thank you for it!! Ive been using your recipe for acne/oil skin prone skin oil cleansing method plus your one with tea tree bromers soap. Its been 1 1/2 weeks but i think the jojoba oil is not for me bc i don’t have oily skin (well my forehead maybe a teeny tiny bit) You ask why I’ve been using it if i don’t have oily skin? Good question… It was a recipe i didn’t need to figure out for myself and I thought bc i have acne i must have oily skin. But now my dry skin is showing on my face (no flaking or anything) just dry/wrinkly looking. Do you recommend swapping out the jojoba for another oil? All of the parts confuse me on combining them. Also, how often do you oil cleanse and how often do you use your face wash with the tea tree soap and bit of oil? Hi! I have acne prone skin and make face masks using tea tree and lemon oil (combined with honey and cinnamon). Do you have any idea if this is a good/ effective combo? I also want to make a moisturizer. I have cocoa butter with jojoba oil in it. Would that make a good moisturizer if combined with tea tree and lemon for my acne prone skin? Definitely check out the end of the post too, where I talk about the importance of diluting essential oils — you definitely want to use a carrier oil or butter. Good luck and have fun! I started using your skin recipes and no longer have an oily face. It happened overnight, I swear. Literally everyday ALL DAY my face isn’t shiny. I NEVER thought that would be possible. Now, on top of that, I see fewer zits and the many many, deep, dark, hideous scars left from years of acne (at least 33 years) are going away after only 1 month of natural skin care. If ONLY I had known sooner. I swear I’m going to have to designate a whole rack in my bathroom for just essential oils. I’M AN ADDICT!! YAYYYYYYY! Missy, your comment totally made my day! I’m so so SO happy to hear it! And LOL about the EOs… I feel ya 🙂 If you’re ever interested in spreading the word about them and joining my Young Living team, let me know! Just wanted to pass this along after many years of trial and error. I have sensitive, acne prone, oily, combo skin. The absolute worst thing for my skin is olive oil. I finally realized that short-chain fatty acids (omega 3’s) were ruining my skin. I know that this won’t apply to everyone. So anyone with skin like mine, try the jojoba, castor oil, even petroleum is better than omega 3’s. There are a lot of little yeasts, and other critters that live on healthy skin in harmony but if you feed them omega-3’s, they will “take over”. Great info. I actually just made this dyi facial moisturizer before I found your blog. Since I am still pretty new and learning about essential oils my question is I used 15 drops of lavender and 15 drops of frankincense in the base oil of jojoba and tamanu. Did I use too much of the essential oils? It depends on the amount of carrier oil you use. I like to do a 2.5-5% dilution since essential oils are VERY strong. I hope someone still reads these comments..
My skin gets very oily during the day and I have blackheads and acne that comes every now and then. I have been trying OCM for about 3 weeks now combined with honey washing. I then moisturize with an oil sometimes with aloe vera sometimes only the oil. At first it worked good, my skin did not get oily and I had much less acne breakouts. But now my skin is starting to get oily again during the day. Why is that? I didn’t see any adjustment period as often mentioned, could that be what is going on now? Have anyone else experienced this method working great for a longer or shorter period of time only to be oily again later (weeks/month)? I do my OCM with castor oil: safflower oil 1:4 because I experienced dry patches on my cheeks with a higher ratio of castor oil. At first I moisturized after the cleansing with coconut oil but now use safflower oil. My face really fells like it needs a moisturizer both after OCM and honey wash. I’m thinking about adding some essentials oils, could that help? I was so happy to have found something that made my face less oily but now when it’s not working as well any longer I’m really bummed out. I hope somebody can help! Hey, Lotta! Well we all have different skin and you should do whatever is best for your skin. It seems like you’ve tried a few different things. Maybe just go back to whatever it was that was working for you. I don’t personally do oil cleansing method. I make a wash with castile soap and honey, and then apply my oils as a moisturizer. My skin loves that. Just another option for you to consider. But again, we’re all different so what works for me may not work for you, and the same goes for other bloggers who’s advice you may read! Hi Nadia! I love your posts and have been wanting to create my own mixture for some time now. I know the mixture above is for your skin but I was wondering your thoughts on using a mixture of jojoba and apricot kernel oil. I have combination skin that tends to be more dry, especially living in Colorado! I’m just not sure if these two oils together is even a good starting place. I appreciate any advice you may have! Thanks. Hey Hannah! Apricot kernel oil is great for dry skin – that sounds like a good combo! I’m in the midst of finalizing the recipes for blends I plan to sell in the near suture, and apricot kernel oil is one of the oils I’m using for a couple of the blends! Hey Natalie, love this mixture! I store mine in a cobalt glass bottle in an air conditioned room, but after about three weeks something started growing in the mixture. It appears stringy and blue/grey in color. Do I need to throw it away or can I continue to use it? And is there any way to prevent this in the future? Thanks! So I want to mix, joboda, tamanu, Lavendar, frankincense (your favorites from this website) but also add carrot seed oil. What is opinion on that? Go for it! Let us know how you like it. Has anyone experienced a stringy growth in this mixture? It looks really gross and I’m not sure what went wrong. Help? If you have any kind of growth THROW IT AWAY. And be sure to sterilize your bottle, equiptment, and workspace next time to prevent bacteria growth – and try not to get any water in the blend!! Hi Nadia, I recently stumbled upon this recipe. I’m new to the world of EOs and I need a little bit more clarity with your instructions. If I’m using a 2 oz bottle as you suggest, do I still need to dilute the Lavender before it goes in the bottle? My other oils are already ready for direct application. Be careful with the use of tamanu oil! If you have a nut allergy, or suffer from oral allergy syndrome and are sensitive to nuts, this oil IS NOT the oil for you. The brand I looked at in the health store I went to had the warning on it (I don’t remember the brand now because I didn’t buy it because I do suffer from OAS and am sensitive to certain nut oils). But you definitely have to read your labels. And there are a few other warnings on the internet stating you shouldn’t use this oil if you are sensitive to or allergic to nuts. Hey! I’ve been reading something things you’ve posted and just had a couple of questions about your routine. Hey, Shavonne! No problem – I’m so happy to have you as a new reader! Hi, Amanda! Oh no!! I’m so sorry to hear that. Unfortunately, everyone’s skin is different so it’s hard to find a one-size-fits-all solution – while this oil blend works great for me (and many other readers) it may just not be best for your skin. 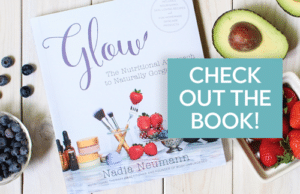 I am happy so say that shortly I will be finishing an eBook I wrote just for readers like you – it’s about the internal imbalances behind most skincare issues (especially acne) and how to set them right with nutrition. While appropriate skincare can help with certain skin issues, it can never 100% resolve the issues – that needs to happen from within. Stay tuned! I have seen a great improvement in the overall look of my pores (including a reduction in blackheads) with this oil, yes. Oh THROW IT AWAY if you suspect any type of bacteria growth! Don’t risk it. And next time, be sure your bottle, work station, and hands are very clean, and try not to get any moisture in the mix afterwards to prevent bacteria growth. Hey Nadia greetings form trinidad 🙂 I just love your posts I found out about you sometime in November and have been reading ever since. I just got my first order of EOs (since you rarely get the good stuff down here) but I don’t have Frankincense :(. Would it be ok for my oily and acne prone skin especially here in the caribbean ti use lavender joba jobs and rosehip only? Quick question – do you leave the oil on or do you wash it off with a face cloth? I leave it on like a moisturizer! This sounds great! How long will this keep before it starts to spoil? And will I need to store it in the dark? I’d say a year if you sterilize your bottle first and don’t get any moisture in it. I will try these oils. I have oily skin at my age I shouldn’t but still do have trouble with some acne, so I will try them and getback to you and let you know how they work. I have been using some oils and frankincense so thank you for these. I am new to essential oils. I want to try the Geranium oil on my face. Could I blend this with hemp oil? If so how much of each? How do you sanitize your dropper bottles? Do you wash your face with this mixture or do you just use it as a moisturizer? What do you wash your makeup and face with if not this? And for the moisturizer, do you wear it at night or morning? I have acne prone skin and I am 21 years old. I have completely tried everything from going to the dermatologist to rodan and fields. I just want to have a clear face like everyone around me. I have mild acne and I have red acne scarring because my skin is the type to scar after one pimple or mosquito bite. Do you think this regime would work for my skin type and if not what do you think i should use? It means that the essential oils make up 3% of the final product. Because essential oils are so extremely concentrated, they need to be diluted in a carrier oil (in this case, the jojoba and tamanu oil). I have all of these ingredients but the tamanu. Would it work nearly as well without the tamanu? Thanks. for your faicial oil blend, you said this is a 3% dilution. what does that mean? i can’t add the lavener oil in the oil blend i have to do something to it first? Hello, this is really helpful! I love tamanu oil, I can put it on a spot and the spot is reduced the next morning. But I was wondering if I can add wheatgerm oil to this recipe? I use it every night and it helps with acne scarring. What do you think of it? Would this face oil be OK to use in the morning before applying makeup? I am not at the point that I would be comfortable going to work without foundation (acne + red & indented scars). I am using a serum at night to help with the scarring so am mainly looking for something to wash my face with in the morning that would still allow me to apply make up. Huh I’ve never used wheatgerm oil and will have to look into it! What does 3% dilution mean? I can’t just simply add the frankincense+lavener oil into the oil blend?? PLEASEEEEEEEE REPLY TO THIS ONE!! As explained, it means the EOs make up 3% of the final mixture. I have made this facial oil blend, EXACTLY as you have described above. When is its expiry date? when transferring the liquids to the glass dropper bottle, should we use a plastic funnel or is a metal funnel better? The oils will not be altered by the metal right, like charcoal/bentonite clay? Hello from Canada! I was wondering if you knew a recipe mixture that would help dry skin? I’ve tried using combos of essential oils and my face just got more dry. I hate using my store bought stuff doubt to all the chemicals but it’s all that works. So if you have a recipe you think will work I’d be much appreciated! Thx for your time ! I’m wondering how you spread the oil after droppering (not a word?) it onto your face. Do you prefer cotton pads, cotton balls, or do you just go a head and use your fingers? I am so excited to try this out! Would it be advisable (and safe) to add Rosehip oil to this mix? Sure! This is just the particular blend that I like for my particular skin – you can add or subtract anything you want to make your own blend! Rosehip oil is a dry oil, so just keep that in mind. It blends well with jojoba oil for that reason. I just use clean fingers! Definitely take a look at your diet – it plays a HUGE role in skin health. Healthy fats, anti-inflammation, and hormone balance all really influence your skin AND those are really influenced by diet and lifestyle. Tackling the issue from both sides is the best way to do it. Best of luck to you! Do you use the oil blend only at night? I was wobdering if i can use it in the morning, or is it wrap gubernamentales to use products with essential oils in the morning ? thanks so much for your great info. i dealt with acne in my younger days and then as an adult had a reaction to a fancy french face powder i bought and have had seborrheic dermatitis ever since. unfortunately, it looks just like acne on me and has no cure. after reading your posts on oils, essential oils and this post i finally decided very cautiously to try putting oil on my face. while it’s only been a couple days i’m amazed at how my skin is clearing up already. i used 2 parts high-linoleic sunflower oil, 1 part jojoba oil, and a few drops of lavender and rosewood which is anti-fungal and anti-aging. i did a honey mask too since that is both antibacterial & antifungal. i think the dermatitis is supposed to be a fungal issue and i have read acne may be as well. Thank God I found your article on the essential facial oils. you stated clearly that coconut oil was not in the list… finally the mystery behind my break out in the past few weeks has been solved. I introduced coconut oil, I know better now to leave it out. Thanks again! I reckon your DIY formula could work well for people. I used an over the counter acne treatment with jojoba oil, tea tree oil, lavende roil and manuka oil and it was better than anything the doc prescribed. Hi Nadia, I recently stumbled upon your website and love your DIYs with EOs (and have since recommended your site to friends and family!). I have a questions in regards to the ingredients. If I decide to add a few more EOS to this mixture (Geranium, Ylang Ylang & Carrot Seed Oil), should I maintain 18 drops of EOs in total as per your suggestion and divide it equally between the 5 oils? I know EOs are potent hence I need to be mindful of the ratio. In terms of usage, if I have a store bought serum that I am currently already using, would it be too much if I layer this over my current serum and follow through with a moisturiser and a sunblock for the day? Even as I type this it seems too much! Pls advise which step I can skip. I live in tropical South East Asia where the weather can get very hot and humid. I’m very interested in knowing what acne treatment that is? I would be so greatful if you could answer here, thanks! LISTEN LISTEN LISTEN, I rarely leave comments anywhere, but you literally just saved my skin! I’ve always had an acne problem and when I recently hit my 30’s everything went haywire. This past Monday I was looking at my swollen face from breakouts that appeared that morning and started to become depressed. I was just about to purchase a $400 acne system because I was so desperate for help. My mom recently got into essential oils and since she had a bathroom cabinet full, I figured let me google and see what I can put on my face now until I can purchase the system. In her batch I found tea tree oil and frankincense. (I’m literally shedding tears writing this.) It’s as if the bumps started going away before my eyes. I spent the rest of my evening randomly walking in front of the mirror because I couldn’t believe it. The next day they were GONE!! I am absolutely a believer and am inspired to help others. I’m so excited for the future of my skin. Thank you so so much Nadia for doing the work and sharing. God bless you. Can you use this both day and night? I have oily acne prone skin. If not, what do you recommend during the day as a moisturizer? Lottis, sounds like you could make it yourself! Nadia, I recently became a new follower and became obsessed with your DIY facial oil combo, however, I substitude the tamanu oil for rose hip. I use it at night and I am absolutely in love with it. I’d love to know what you use in the morning for day time wear. Do you have a favorite AM oil combo ? Is there a reason you use Jojoba oil over hemp seed oil? I know that Jojoba has a level 2 comedogenic rating, while hemp seed has a 0. I tried the oil cleansing method with coconut oil….WORST decision of my life. My skin broke out miserably yet I could see how beautiful it looked under the acne. This site is so educational! Thank you for doing it!! Do you have any thoughts or experience on tallow? I was looking at this site: http://www.goldclover.co/what-is-tallow/. I have heard testimonials that it is great for your skin, but it sounds a little crazy to put basically beef fat (that is, rendered suet from organic grass fed and finished bovines) on your face! What do you think about it?? What do you mean by “This is a 3% dilution” it means 3% of the oil mixes and 97% water? No, it means the essential oils make up 3% of the final product. Hi! Thanks for this great recipe but I have a technical q. In another post you said 1 drop EO to 1 ml of carrier oil is 5% dilution. This recipe has 4 tbsp which is 60 ml carrier oil. So how is 18 drops of EO a 3% dilution? Wouldnt a 3% dilution be 36 drops of EO? Please correct me if I misunderstood. Thanks for all the useful info! Addition to my previous comment: 60ml is 1200 drops of oil based on your saying that 20 drops=1ml so 1200x.03=36. Totally possible I misunderstood. Please respond and correct me if I’m wrong. Don’t mean to be annoying and technical just didn’t know if I could add more EO safely! I made this oil but substituted lavender for rosehipseed (w/vitamin e), I really like it but the scent is a little intense. Can I still add lavender? If so, how many drops do you suggest? I also made a night oil with the same but use avocado oil in place of jojoba. How soon does this natural moisturizer start showing its effect? I have acne prone sensitive and mixed skin type which looks quite red/inflamed most of the times. cheeks are extremely dry and T zone oily. Ive used it only couple of times till now- no bad affect, but I was hoping it would calm the redness on my face a little bit. Also I leave it overnight and wash with a facewash(cetaphil) next day morning. is it ok to wash it away with a face wash after leaving it for the night or that will defy the purpose? I use facewash twice a day- morning and night. I have oily skin which is prone to acne, upon researching about oils I’ve read that rosehip oil and grapeseed oil help reduce scars and stuff, so could I substitute them for the lavender and frankincense? Would they work in the same way? Thanks! I have moderate acne and its localized around my mouth and lower part of my cheeks. Can I mix almond oil, lavender oil, and tea tree oil to get rid of my acne? and also have you heard of tinture root oil? I’m using an essential oil blend, with grape seed oil as the carrier. What do you recommend to combat the shiny residue? Blotting ? Approx- $215 is a large investment for a 16 year old girl without a job. So I was wondering how often you have to rebuy the products (with the links you provided) ? Oh gosh, is that how much it is all together?? Not often at all. Also, if you are interested in oils I’d start with maybe just 1. 8 oz of organic jojoba oil (which is a TON of oil) is about $10. Hi! I am absolutely thrilled about your blog! I am 21 years old..possess an acne prone skin, with blemishes..sun tanned skin..I have recently quit all the commercial products!! Since I am very new to the oils..I am hesitant to spend on Tamanu oil..could you suggest another oil in its place! Also, instead of Frankincense can I use Rosemary? I know this post is old but was wondering if I could replace the jojoba with something less comedogenic? Maybe hemp or sunflower? Rosehip would be a good substitute (though I do love jojoba for oily skin since it mimics the skin’s natural sebum and tricks it into producing less oil). Grapeseed would also be a great sub for those with oily skin since it is on the dry side and sinks right in. I use my oil blends every night! You are correct, the glass will not leach chemicals like plastic does. Hey Nadia! I just ordered Jojoba and Tamanu oil to create this lovely face oil! Instead of buying the lavender and frankincense I bought roseship oil. Would creating a mixture with these three be equally as effective for acne prone skin? My goals for my face are to even my skin tone, reduce oil and improve my blemishes while reducing the appearance of old acne scars. I would love to hear back! Thanks! The difference is that lavender and frankincense are essential oils whereas rosehip is another carrier oil like jojoba and tamanu. Rosehip is great with cell regeneration, so may be helpful for you. You don’t need the essential oils per se but they do carry their own benefits. Is there adverse effect if I were to mix all these oils? Love this face oil. I have oily skin so I only use a few drops but it has made a huge difference in the texture and look of my skin! Thank you! Two questions about this oil–I’m so eager to try it. First, I just started using Trilogy’s Rosehip Oil, and so far I really love it, but since I’m always so afraid of breaking out, it would give me peace of mind to use an oil mixture such as the one you list above that include ingredients to specifically prevent breakouts. So, would you recommend I use the two together? If so, should I layer any one specifically first? Or maybe just use one in the morning and the other at night? Lastly, I noticed you say that the formula is a 3% dilution, so what do you dilute it with? I guess one final question, I’ve heard olive oil is a really great Cleanser for people who were previously on Accutane, so I’ve been wanting to try DHC’a Deep Cleansing Oil, but not sure if using too many things to fight acne then when in combo with Rosehip and your oil above? Okay now this is the final question…what do you think of Argan Oil? If you’ve read this far thank you! Love your site. I know I just commented on your other story, but forgot to ask what you dilute this mixture with since you say the oils only make up a 3% dilution. Wondering what you dilute this solution with since you mention the oils make up 3% of the mixture. The essential oils make up 3% of the mixture. They are diluted in the carrier oils. Just pounced upon your blog and so fascinated with your natural stuff. I am in Jamaica and a naturalist, not a 100% but I have a daughter (20) terrible hair bumps her cheeks and neck – very embarrassing. what do u suggest only this morning I told her to go a face place. Where do you buy your jojoba oil? How do you make sure it’s 100% organic? I’ve finally started using oil instead of a cream moisturizer and I love it! I have acne prone skin so am looking to try something specified to that. Do you suggest trying this combo off the bat, or is there one that can be used on it’s own that works well for this? Katherine, I purchase the Desert Essence brand that I link to through Amazon in the post. It’s USDA certified organic — any product that carries that seal must adhere to certain organic standards. I also love and recommend Mountain Rose Herbs for ALL homemade skincare and beauty products. They’re fantastic and sell a lot of certified organic products. I just started looking for information to know how to use only oils on my face or to try 100% natural DIY skincare routine after my skin changed from normal to combo to now seems oily and maybe first stage of rosácea? So, I wanted to know if it would be posible to ask you a few questions! Well I made a list of low comesogenic and high linoneic oils and with 18! Between essential and “base”or … carrier? (I’m Hispanic sorry) what I wanted to know is … is it bad to mix too many oils? Because I really wanted to arrive to the perfect balance between them doing two different combinations to night and day. Just followed you! I’m so rude, I forget to say I love your blog and that I’m so glad that people like you take the personal time of your life to explain us how to do it the right way and share all this gold information. What can replace the frankincense essential oil? Can i use instead rosehip oil or tea tree oil? 1- Melaleuca oil (tea tree) is widely used for oily and acne skin. Is there any specific reason why it is not in the recipe? 2- I’ve been reading that vitamin E is a natural preservative. Is it possible to put it in a recipe or do not need it? Yes just remember the proper dilution ratio! Hi Nadia! Thanks for all of your posts… I really love what you post. I was wondering if you could experiment on an oil blend for acne prone skin as well as having anti-aging properties. It could be for day or night or both. Thanks!! If you were going to add liquid vitamin E to this mix (I have a bottle kicking around…), how many drops would you add? I assume this is a good idea since vitamin E nourishes skin, but maybe not? Do you think I could use hemp oil in place of the jojoba? Do you use this after the cleansing wash? Or is this a replacement for a cleansing wash? What is the order that you use when you are doing your regimen? Some people use oil for the Oil Cleansing Method but I use it as a moisturizer. Do you think I could add manuka essential oil to this? Definitely. Manuka is a bit like tea tree in its antibacterial properties. Just remember the ratio! Hi Nadia! So glad I found your website. I am curious about oils myself and always thought that adding oil to my already oily face was a bad idea. But the more I kept reading about oils, the more I was intrigued and determined to try it in attempts to get rid of my adult acne and heal my post inflammatory hyperpigmentations. After reading this post, I feel like I need to head to my nearest down to earth store to stock up on these oils! However it does seem like much to indulge in… I’d like to ask is there a “top 3” oil combination (or separate) that you would recommend for oily, acne-prone skin? My goal is to prevent acne and more importantly get rid of these brown acne hyperpigmentations… I currently have castor, rosehip, tea tree, argan, and bio-oil. My collection is slowly getting there but I am still learning how to use them and even mixing them which I haven’t tried yet. Hope to hear from you. Thank you for sharing! Ta tree straight is probably irritating her skin even more. It’s important to dilute it. Yes, grapeseed is a good substitute for jojoba. You can omit the tamanu but I’d include a lesser amount of tea tree so it doesn’t irritate her skin. I started using this a couple months and it’s a life saver. My acne cleared up so fast and stayed away. Recently however I started having an allergic reaction and had little bumps all over my face. I figured out it was from the tamanu oil. So I was wondering wether you’ve heard of this happening before as a long term affect and also what substitute you’d recommend in place of the tamanu oil. Thank you so much I will definitely try those out and let you know! Also I started testing the oils individually and with the lavender and jojoba nothing happened then a day after using the tamanu the bumps came back. I don’t have a nut allergy but just sensitive skin in general. Is this something you’d use in the morning and night if you don’t wear makeup? Yes! I do suggest using something with a bit of SPF (non-nano zinc oxide is the healthiest option) during the day for protection, but if you’re not worried about sun coverage than yes! Hey, Lyn! Well 60 ml is about 2 oz, and 4 tbs is 2 oz so it should fill it up! Did you add teaspoons? Either way, if you’d like you can certainly add more carrier oil! But it will dilute the essential oils more (not necessarily a bad thing). You dilute the essential oils in the carrier oils. So the essential oils make up just 3% of the final oil blend (the carrier oils make up the other 97%). Hi, so excited to try these oils I have just recently gotten into the diy;) just wondering, lately now that I’m in my thirties I am struggling with body acne and scarring and I wondered if u had any suggestions? Hi Nadia! I just found your blog and am loving all of your advice and ideas so far. I have been experiencing adult acne for the last few years and have tried everything! I have finally decided to go off of the birth control pill and try to get my “body unburdened”!!! I have a question about blending these oils (first time here).. how accurate do the measurements have to be? I found it difficult to get everything into the bottle (it was messy) and the EOs came out of their bottles faster than expected! Also, I sterilized the bottle and dropper but not my measuring utensils.. is that a problem for keeping the blend from going rancid? Thanks so much! hi, i donwt have tamanu oil, with what can i replace it? First off, I love your website!! I have found it so helpful that I have made a whole note of your blog posts! Thank you so much for them! After reading up about the oil cleansing method on your website and a few others, I’ve been trying it as well. I’ve been using a mixture of – 1part Castor oil + 2part Jojoba Oil + drops of lavender oil and Tea tree oil. When I used the same mixture, without the castor oil, I had very less breakouts. It has been 2 weeks now of adding castor oil to the mixture because I read that it cleans its more. With this set, is there any combination I could use by substituting tamanu oil and frankincense oil from your blend to try? I would be extremely grateful if you could help me with this, but I do understand that you are overwhelmed with work!! So, either way, THANK YOU SO MUCH! Just wondering why you don’t use the oil cleansing method in your Beauty routine instead of an actual cleanser? I see that you’re using the charcoal soap instead so I was just curious because I’ve been thinking of trying oil cleansing which is how I found your site so just trying to get all info possible- thx! Hi, Bess! Well you can add some vitamin E oil (https://www.mountainroseherbs.com/products/vitamin-e-oil/profile) to help preserve the delicate fatty acids in the hemp seed oil. Be sure to check the proper dillution, as advised by Mountain Rose Herbs. Can I use tea tree oil instead of lavendar oil in your face oil recipe? I have oily acne-blemish prone skin. And if i use the face oil at night as a moiturizer, should I wash my face with a face wash in the morn? I have an oily and acne prone skin. Hello! I recently began using this oil blend (4 drops) at night after toning my face with witch hazel and then finishing with Mario Badescu rosewater spray. While my skin is INCREDIBLY soft and supple when I wake up, I’ve been noticing more bumps on my cheeks. Not pimples by any means, but like…when I look in a mirror with a slight shadow, I can see a lot of texture (clogged pores). Do you have any advice on how to combat this? I’m thinking about cutting back to 2-3 drops. My totally uneducated guess is that maybe my skin can’t handle the amount of oil so it can’t absorb it…or possibly my skin is just adjusting? Thank you so much! Hi- is there something I can replace the Frankincense oil with? So happy to have stumbled upon your website! I have struggled with pimples/blackheads since I can remember. I tried using different oils when I was younger, however I didn’t know which ones to use and never stuck with them long enough. Anyway, all this to say, I just bought these oils off Amazon and will be making this mixture as soon as they arrive! My question for you is, is getting a facial a bad idea? I’ve never gotten one, but feel as though I have SO many clogged pores. I’ve had a very healthy diet for pretty much my entire life, so trying to find natural products to clear my face has always been the really big struggle. Also, I read about how you use castile soap. If I were to buy a castile soap bar, are there any specific ones you would recommend? Hi! Instead of using this oil blend recipe as a moisturizer, can it be used to do an oil cleanse as well? Hi Nadia… Do you use this at night or during the day..? Should I wear it or leave it…and just put my make up on top as usual.. What should I do? Well you can do whatever you want! 🙂 I personally just use it at night and use it as my moisturizer. Hi! I’ve been using this since 2016 with awesome results. I just went to make a new batch tonight but noticed the ingredients have changed. Wasn’t it jojoba oil and tamanu? Please let me know and the ratios. I know it was this oil as I’ve been using it a few years and I also make your foaming face cleanser which replaced my desert essence tea tree oil one I’d been buying. Thank you! You’re right I just changed it – the other day with an updated version I’ve been using recently but I’m thinking now that may have been a bad idea for those who don’t have the old recipe saved! Just put the old recipe back. Just made this last night. I’ve been breaking out real bad so I’m really excited to use this and hope it works. How do you apply it? With a cotton or with your hands? Do you rub it in your face or pat it on? Hey Nadia!! I’m new to oils and just found your blog and LOVE all your expertise! How do you store your oils? Do they go rancid? I know you mentioned adding a drop of vitamin E oil to your blends to keep them fresh, but what about the individual bottles of carrier oils? Refrigerate? Thanks! This face oil literally changed my life! I’ve been using it for about a year now and my acne has pretty much completely cleared up. My scars are also fading slowly but surely. This paired with an exfoliator has transformed my skin. Of course I still get blemishes but I’m now not a 30-year old with acne. Thank you so much! Katie, that makes me so incredibly happy to hear!! How long will it take for the oils to start working? How would you use this in your skincare routine ?